It’s Still Too Hot Here! Right now I’m in Singapore, staying with my in-laws. A work assignment brings me back – to a place where I lived, worked, married and ran. The 24 hour flight and 12 hour time difference have left me jet lagged and sleep deprived. No prizes for guessing what I did soon after arriving. I figured it would help revive me – and heavy rain had reduced the temperature to an almost bearable 27C (80F), but pushed the humidity to 100%. My 6 mile run took me through Dover (a former British military and residential neighborhood), past Biopolis (a research and development ‘hub’ – Singapore loves ‘hubs’), and ended on a drainage canal that forms part of the Ulu Pandan Park Connector. Soon after getting back, and after several cups of coffee, I gave up trying to revive myself and took a nap – for 5 hours, slightly more than the 40 winks I had in mind. At 10pm later that day I was wide awake, as though it were 10am. As indeed it was according to my body clock. So I ventured out for my second run, a 6 mile loop that took me past Ngee Ann Polytechnic, where I used to teach, and down Old Holland Road where a few skateboarders were all that punctured the late night silence (see this motorcyclists’ video clip complete with Bollywood soundtrack). It’s now the end of the day after I arrived. It was warmer today, a more normal 32C (90F). The rain had stopped and the sun had poked it’s head out from behind the clouds. I did a 4 mile run this morning, again along the Ulu Pandan Park Connector (this time going in the opposite direction to the previous day), and then a 6 mile run this evening (the Dover run as above but with a circuit of University Town). 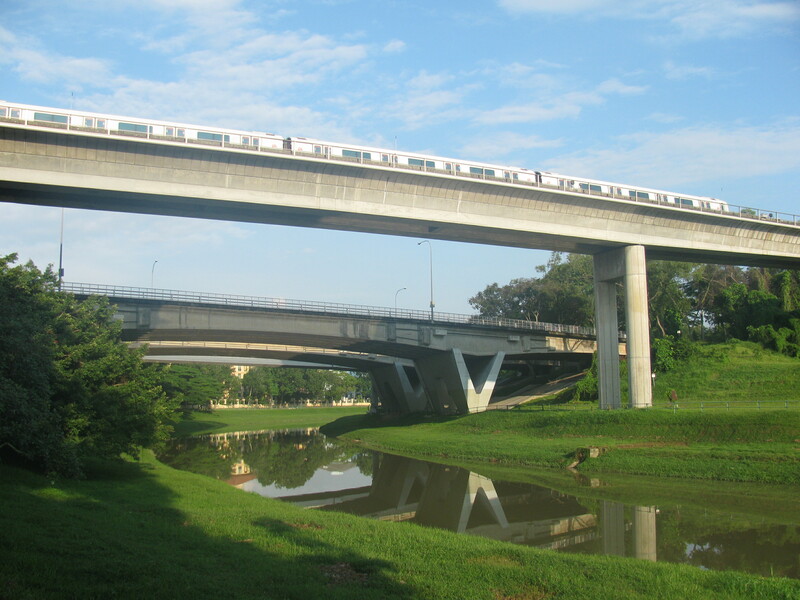 The canal along the Ulu Pandan connector with a MRT train passing by overhead. The last few days have confirmed what I always knew. That Singapore is too hot to be ideal for running – more so when you have just come from 5C (40F) in New York. Still it’s a fascinating place to run in. Over the coming few days I hope to rediscover my old running routes including: MacRitchie Reservoir, from which MR25 (the running club I used to compete for until I left 7 years ago) gets its name; the Singapore Botanic Gardens, an urban oasis just minutes from Orchard Road, Singapore’s answer to New York’s Fifth Avenue; and Bukit Brown, an old Chinese cemetery. I also plan on exploring the new running options offered by the closure of the Singapore-Kranji railway line and the turfing over of its tracks. And to cap it all on Sunday, March 18 I compete in the 2012 Aviva Ironman 70.3 Singapore – actually as part of a mixed team with Nicholas Fang (bike) and Shu Yin Ong (swim). Nick and I are unbeaten in Singapore – so far! Watch this space. 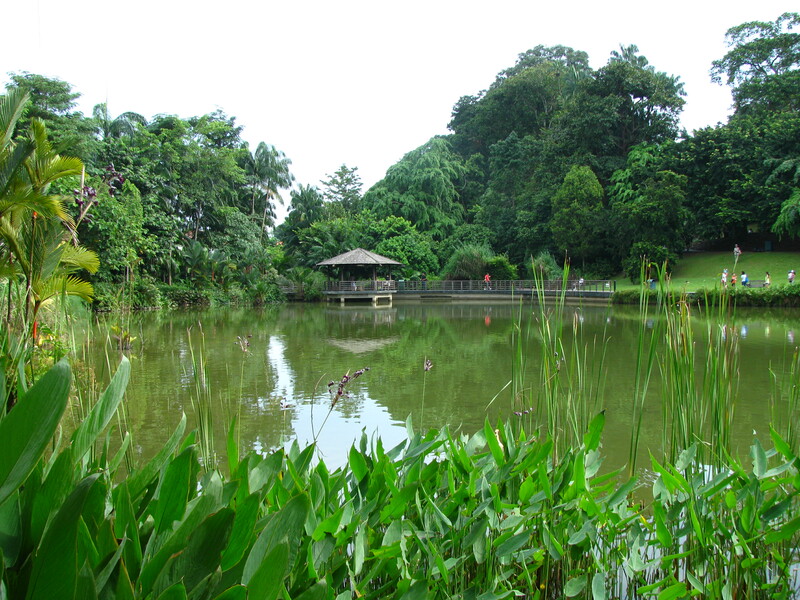 One of the ponds in Botanic Gardens.